home → Loans → Cash Advance & Payday Loans → What is an Emergency Cash Loan? An emergency cash loan is designed to get you the cash you need as quickly as possible. It is also sometimes referred to as a cash advance, or payday loan. Here are the basics of emergency cash loans and how they work. 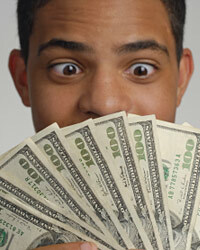 In order to get an emergency cash loan, you can visit a cash advance merchant or find one online. You will have to fill out a loan application that covers all of your personal information. They will want to make sure that you are employed and have sufficient income coming in to repay the loan. These loans typically do not involve a credit check and have very fast approvals. If you are approved, they will usually wire the money into your bank account within 24 hours. Then, you will have a certain amount of time to repay the loan and they will charge you a predefined amount of interest on the loan. While emergency cash loans can help you get money quickly, they are not always in your best interests. The interest rates that are charged for this type of loan are very high. This, in addition to the fees that they charge, can actually contribute to your financial problems instead of help you avoid them.